The Outsiders Within project is based on collaboration between the Lutheran Church and local academics, conservators and collection managers. The Lutheran Church precinct is located in Strand Street, central Cape Town, and is the oldest remaining group of public buildings in South Africa. This National Heritage Site houses an archive of unique manuscripts dating back to the 1740s. The Outsiders Within team discovered documents and papers that were carefully stored but never publicly accessible, and soon realized that they contain exceptional information. For instance, among the diverse Church records is evidence that brings new insights into South Africa’s history of resistance to colonial dominance. 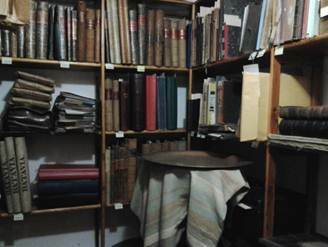 In 2011, the Evangelical Lutheran Church in Strand Street (ELC) appointed consultants to undertake a heritage evaluation of their property for the South African Heritage Resources Agency (SAHRA). During that process, the history of the Church and its community was further uncovered and the Outsiders Within team discovered an archive with documents and papers that had not been publicly opened ever before, some dating back to the 1740s. Among the team members were Antonia Malan and Prof. Nigel Worden. Sally Titlestad is the Project Manager for the Outsiders Within project and Heritage management consultant to the church. Sally is a well-known heritage consultant who has undertaken extensive research into the Cape’s early history and has been involved on numerous significant heritage studies on sites in the city. Sally is a member of the Association of Professional Heritage Practitioners (APHP) as well as being a member of the Vernacs. Sally Titlestad and Mike Scurr are nearing completion of an ICMP for the complex. The website has more information on the project as well as a gallery of images.